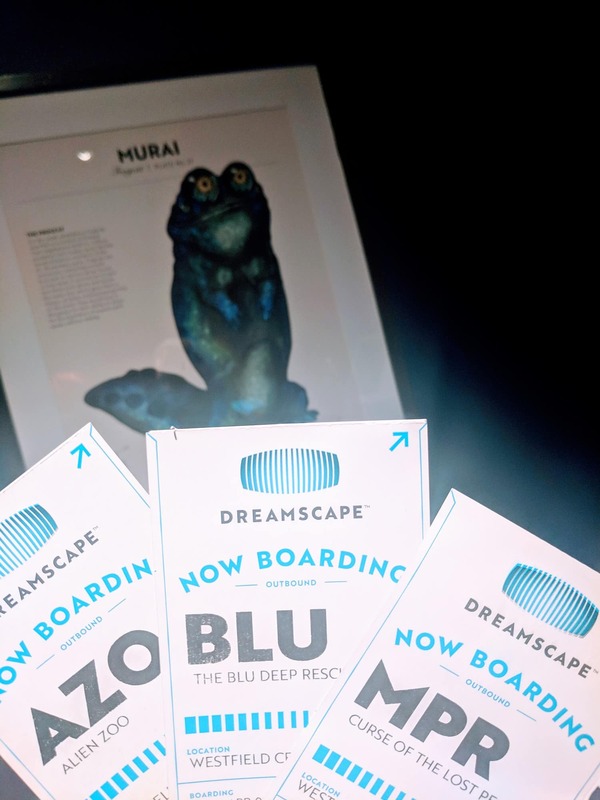 Dreamscape Immersive, a year-round virtual reality theater in Los Angeles, uses cutting-edge Motion Capture technology to keep track of six participants inside of a computer-generated world simultaneously. With three impressive adventures — Alien Zoo, The Blu: Deep Rescue, and Curse of the Lost Pearl: A Magic Projector Adventure — ranging from beautifully awe-inspiring to thrillingly interactive, there’s an experience here for everyone. Each show runs twenty minutes, allowing enough time to enjoy the atmosphere without feeling too lengthy. This VR palace differentiates itself from others by allowing friends to work together to complete extraordinary missions that blend the fabric of reality with computer-generated graphics. 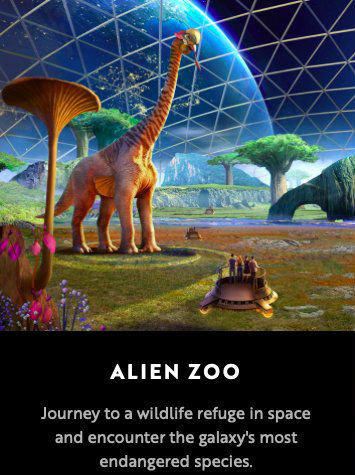 In Alien Zoo, the show advised for first-time Virtual Reality users, you’re asked to step aboard a spaceship to visit an intergalactic zoo with fellow travelers. Once you finally make it inside the park, and with the exposition of the story so eloquently narrated, you are given a moment to stand in awe of the land around you — alien creatures wander plains, gorgeous galactic skies stretch as far as the eye can see, and your exploration vehicle gently buzzes beneath your feet. 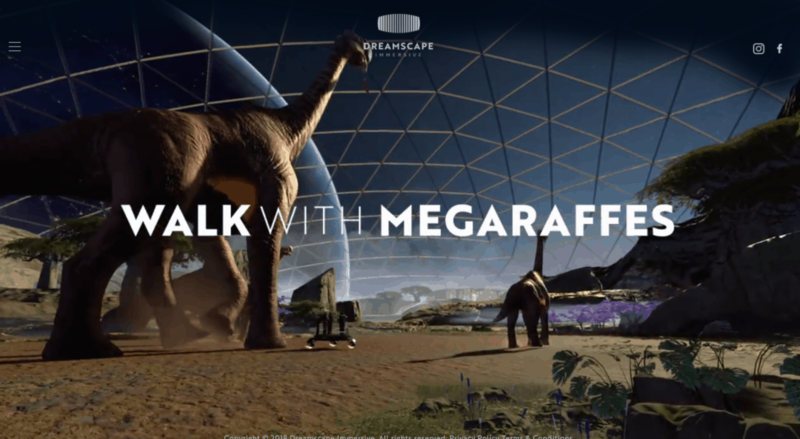 On a whirlwind ride around the zoo, you are encouraged to pet the alien life forms and interact with your environment to progress through the story. Physical touch is often used throughout the experience, blurring the lines between what you see and what is really there. This show is by far the best one to do in a group, especially with first-timers or children; being able to have someone else confirm that you really did just play catch with a Frogcat is half the fun. 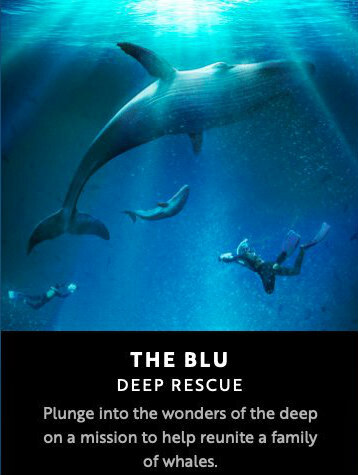 Another experience in their series, The Blu: Deep Rescue, is a collaboration with WeVR in which your scuba-geared avatar quickly dives into the sea and hops on an underwater scooter to save a lost whale. While you won’t quite get a true underwater scuba experience, your VR gear weighs you down like a wet suit and a crisp breeze blows in your face as the scooter zooms around the majestic ocean landscapes, making it easy to forget the inconsistencies. This experience expertly plays to the 360-degree strengths of VR. No matter which direction you’re facing, you are immersed in stunning views of marine life, and at the end of the experience, rewarded with a once-in-a-lifetime swim with creatures of the deep. If you’re the type of reflective virtual reality-goer who finds yourself stopping in starry-eyed wonder at the environment around you, this is the adventure for you. Finally, Curse of the Lost Pearl: A Magic Projector Adventure is the most advanced show of their line-up. This tale is part movie, part action game, and part escape room. While you are physically only moving throughout one room the whole time, your in-game avatar jumps from a projector light straight into an action-adventure movie where you become the hero. Before my experience, one kind guide in the Dreamscape lobby gave us the hint to grab torches as soon as we saw them. Without warning, the players are almost immediately separated in-game, solving puzzles, jumping through spikes, avoiding heated lava, and finding their winding way to the lost pearl on two different tracks. Assuming everyone makes it through the game, players are eventually reunited, as a scenic sunset passes by with your real names in the end credits. 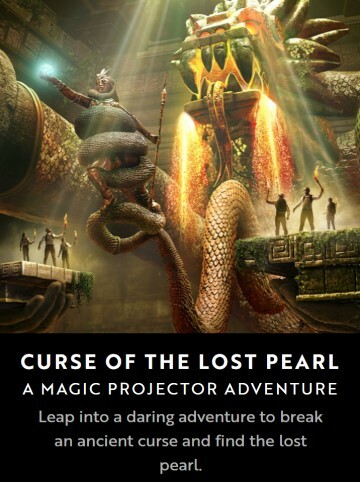 A fast-paced ride from beginning to end, Curse of the Lost Pearl is perfect for gamers and thrill-seekers alike; it stands out as the most interactive of Dreamscape’s three offerings and seems to be a fan favorite. While waiting for your group to be called, there is a lounge area with beverages, Dreamscape merchandise, and relevant books available for purchase or to peruse. Lining the walls are pictures of retro virtual reality headsets and museum-like artifacts from their show lore, such as an old-school projector or a diagram of the alien creatures from the statue outside. Once any of the twenty-minute experiences are over and the movement below your feet ceases, your actual, human self must take off the headset and return it to the numbered bench. On your way back to the waiting area, you will pass a convenient mirror by the exit to check your headset hair before entering the real world again, most likely with an adrenaline-induced smile on your face. What Dreamscape Immersive has created makes it hard to want to leave. Their unprecedented Virtual Reality content uses multiple senses to transport you to the places where dreams are made. The experiences are rich in details and the interactive capabilities are addictive; one viewing is not nearly enough. Luckily, each show has a reasonable $20 ticket price, and we’re told that eventually more content will be rolling out at locations across the nation.